For over 15 years RestSoft has been providing affordable and fully customized restaurant point of sale software and hardware to clients in Ottawa and the surrounding area. Our goal is to provide our clients with a simple to use and reliable point of sale solution. 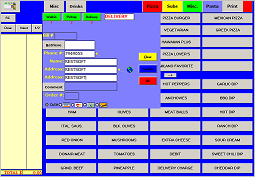 Our point of sale software (called RestSoft) can be found in all kinds of restaurants from fine dining and pizza take-out to Chinese take-out, cafe's and diners. RestSoft has also been installed in several large franchise restaurants including Burrito gringo Mexican Grill Willys Pizza, and Milano Pizzeria. Selecting a point of sale solution for your restaurant can be a difficult task. You want the software to be easy to use, be full featured and offer flexibility to ensure that it will integrate seamlessly into your operation. RestSoft is unique in the point of sale industry. Unlike our competitors, we are not resellers of someone else's software but we are the actual developers of the point of sale software which is called RestSoft. Because of this, we can customize the software to fit our client's particular business requirements and budget. You won't need to work around the limitations of the software, our software is designed to work with you and your business. Choosing the correct point of sale hardware is important to the success of any point of sale installation. RestSoft supplies and installs quality point of sale hardware to restaurants including touch screen monitors, thermal receipt printers, impact receipt printers, automated cash boxes etc. We understand how critical it is that your restaurant's point of sale system is operational 24/7. This is why RestSoft provides all our clients with 24 hour email and phone support. In addition, we offer monthly (view monthly support plan) and annual maintenance plans from just $140 per/year that ensures your hardware is operating at peak performance. For more information on the products and services offered by RestSoft click the link below. Does your restaurant need a simple to use point of sale solution? Are you in need of a replacement thermal receipt printer or touch screen? Have a business problem but can't find a software package that meets your requirements?